In one game neither of us could win, so i offered draw twice and the other one declined and started provoking me to hit his bombs. We continued playing for about an hour and 20 min doing nothing. Then apparently he had to leave cause he started hitting my bombs in case i had an uncovered flag and lost. That was sweeeeeet! @Major Nelson: You should have reported him for draw refusal. Just had a game against Marshal Brain (mid plat) - I thought we were around even in material, but for some reason (maybe I was marginally up) he decided to start lotto-ing with his colonel and took some unmoved pieces to gain a decent 2-3 mid-level piece advantage before stopping. His flag looked to be in a lake-column wedge, and I'd checked the right already earlier in the game. I successfully used a captain to lure a col/major pair far enough away (to capture my cap) to get a miner in to diffuse the top of the wedge behind the left lake. The miner was taken by a captain, at which point I traded cols, then got my major to the square in front of his flag 1 move before he could stop me. His lotto-ing made it a nice win, but multiplying the satisfaction n-fold were the facts that 1) his lotto-ing col passed my open flag, and 2) he was also a disconnecting loser, closing out the moment i brought my major in front of his flag. I got one for you - just played some d-bag called The Mule who proceeded to talk rubbish throughout the game. We got into a situation where all I could do was run my general around one of the squares, and he kept moving his round too so I couldn't get to the other side of the board (as I'd seen all his bombs but everything else was on the other side) meanwhile he had 2 caps and 2 cols that I didn't have. I was hoping if he lost his last miner I could force a draw. However his last miner removed one of the bombs guarding my flag. I took the miner, and curiously after that he never used any pieces to guess at the piece behind the bomb he'd taken out. After about half an hour of the generals moving about, he finally used a captain - oddly on the one next to the flag, which was of course another bomb. Bear in mind all the while this is going on he's saying dumb things like "remember what the Mule is doing to you!" and chatting crap. Anyway, he's using his other cap and 2 cols to guard his flag and I still have a scout left. I decide to trade the gens down after moving various other pieces into position. Now all he can do is keep moving his 3 pieces back and forwards by the flag, as he doesn't know which one my scout is. This goes on for another 20 minutes or so, he's not talking now - but no sign of being willing to tie either. All of a sudden he moves a piece out, giving me a line to the flag. Has he gambled? Did he click on the wrong square? I dont know, but I'm gutted as it's my spy sitting there, not my scout. However, I decide to make him feel bad since he's been doing all the talking so far and now he's potentially given me the game. I say a couple things like "hahaha, not talking now?" and "oooops!" and lo and behold - he RUNS AWAY AND DISCONNECTS! I nearly wet myself. Here's a d-bag that's obviously got an alias account, who's spent the last 74 MINUTES talking crap at me, and through the power of belief I've just made him think he's lost and he's run away! Absolutely brilliant. I stopped playing this game for a while as I got fed up with all the alias players, the stuff here my brother had to deal with recently, etc. But this must be the most satisfying win ever. And of course, what story is complete without the proof of the pudding? Here it is! So where the spy is, he'd finally moved that piece forwards and then obviously thought it was the scout because of what I said to him. The flag is back row 3rd from right so you can see he's opened up the path to it - but it's no use to me! That's what makes his disconnecting so funny. So Mule, if you read this - YOU remember what Iron Maiden did to YOU. YOU remember not to chat crap before you got the match won. YOU remember not to be such a wimp in future and go for the piece behind the bomb you took out. And YOU remember not to disconnect like a little girl because as you can see, you hadn't actually lost!! Edited by iron_maiden, 15 April 2017 - 12:05 AM. Man, that is a funny story. The timing of your comments must have been spot on to make him believe it like that. So-o funny! 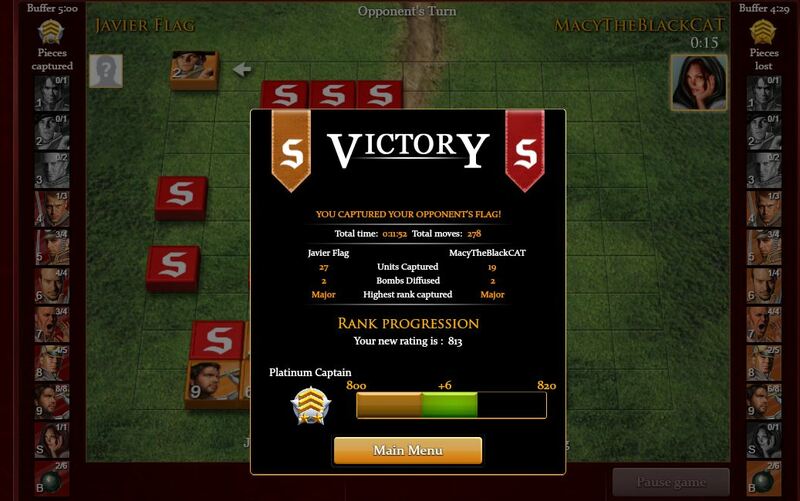 ... stratego is a game of bluff ... even by chat it works !!! I just had a game where I had a bombed-in flag and two lower pieces against two higher pieces and a known, open flag fourth from the left on his back row. The only chance I had was to lure his pieces together away from his flag to try and kill one of my pieces off. I really looked hopeless, I guess, backing one piece all the way to my lower left corner, but I was really surprised when he did break off his second piece from chasing me around the right lake to go for the kill. He probably knew it was risky but he marched right over and killed my left piece, while I steadily moved up on the right side and over onto his side of the board. After the left side kill he began marching furiously back to his side but he was too late and I had him beat by a couple of steps. I've been guilty of losing games exactly like that so it's fun to be on the other side for a change. Just had my run against Anna 1984 - I'd seen the infamous username from the shufflers discussion so I created an anti-shufflers setup and went to work - it was a very, very long game (just over 2 hours), with both of us basically doing nothing for 5+ minutes at a time - thankfully she didn't propose a draw, as I may not have been able to pull out the win if my attack was rushed. The whole context is a bit lengthy to explain, but based on gameplay it was somewhat clear where the spy was (along the left side of the board, in her first row, with the rest of the row mostly cleared out). I bluffed my last scout as a mid-ranked piece to chase a sergeant away, and then parked the scout on the right side of the board, across from what I thought was her spy. For most of the mid-game she was very careful to keep at least one piece blocking this line of attack, but after a lot of shuffling around on both our parts, (I like to think my baiting the blocking pieces out had something to do with it), she opened up the lane for a single turn, allowing me to get the spy From there it was pretty easy to get enough of a material advantage to pull out a win, since the shufflers like to group a lot of moved pieces together. Anyways it was a very long but good and challenging game, and the flag ended up being the very last piece I checked - any game that you put over 2 hours into is very satisfying to win! I had a brilliant win this morning against "mvpdad", who I've played before and was soundly beaten by. I worked up a 3 captain advantage early on in the game, but he called by colonel-marshal bluff and took my colonel with his general. I was able to snag a major from him, however, shortly afterward with my other colonel, having discovered his marshal and general. I decided to take his general with my marshal in exchange for my marshal, as I knew the spy was right behind. Very soon afterward mvpdad smartly forced my general and major against his marshal and colonel from the middle to the left-mid section of the board, and once again called my gen-spy bluff by taking my gen with his marshal (unfortunately my spy couldn't make it in time, so I buffed another piece, and he did not buy it) and then, in turn, trapped my major between his marshal and col. I thought for sure I would lose and as about to surrender. I had 2 captains, sarge, and 5 minors, and mvpdad had his marshal, col, 2 sarges, and 4 minors. mvpdad had also trapped one of my capts with his two pieces. I escaped with my other captain and was able to lotto 2 minors and a sarge before nailing a bomb. Then we exchanged sarges, and my three minors won against his 2 powerpieces. Any other win before this point pales in comparison to the satisfaction of destroying 'Onslaught' in our game just now. His ridiculous blitz forced me to trade marshals early in order to prevent further lotto damage. Down a major and 3 captains, odds were very long, but a tad of luck (lotto'd a piece that was highly unlikely to be a bomb based on blitzer setups, and got a major back), and some very poor play on his part, I ended up getting the win, and causing him to disconnect after his distasteful remarks. For most of the game I didn't think I'd be able to come back, but thankfully I kept at it and got the Victory screen after the 2:30 wait. If anyone faces him in the future, the side on your left is bombed off with pieces all cap and lower, and his flag is on the right behind the lake, with a captain on either side. Cheers Onslaught, hope to play you again. Edited by despy, 19 April 2017 - 06:26 PM. They say a picture is worth a thousand words - there's a lot behind the story of why I'm so behind in pieces, but I think the final screen sums up why this is a satisfying win. To my opponent's credit, he actually played a ridiculously good game for being in Silver. Edited by despy, 20 April 2017 - 03:08 AM. Perhaps the game I just won to get my highest achieved ELO. Absolutely unbelieveable win this morning. I had dropped two games straight and was going to drop a third-- so I thought. I was matched up with a player called "Ginnias", who turned out to be a Anna1984 - shuffler-type. Very annoying. I had to do all the attacking or we'd have a draw (and losing 2 games straight prior to this match I didn't want a draw). Eventually I got ticked off at this guy's shuffling garbage and made some chances that didn't pay off. The only good thing that happened was he used minors like scouts . During the endgame I had a marshal, leuit, scout and 4 minors. Ginnias had a marshal, colonel, 2 captains, 2 sargeants, 2 minors, a scout and a spy. I had lost my spy. What are the chances? Well, I guessed with my scout at a piece that he was acting like was a captain.. and it was his spy!! Ok, not bad. Now I can lotto with my marshal, as his marshal was on the other side of the board. I went on an excellent lotto streak, collecting a sergeant, minor, scout and trapping a cap with 2-squares! Ok, maybe I have a fighting chance. His marshal traps mine and we trade. But he still has a sarge, capt, col, and minor, and I can't get to his flag, even though I have 4 minors. So I bluff my leuit as my minor and he comes to trap it with his col and sarge... and he hits it with the sarge! Sweet! Although my leuit is now trapped and was killed by col, his served a good purpose. Then I am able to sneak my scout around to his open flag as he guards all my minor with his 3 pieces in all columns. That was very low chances, extremely shocked I won. I just won a game where the guy actually did have a flag on the front row! 1st column on my left on the board. He was moving everything over that way early on and had the right side bombed off. Scary but true, he was up in the game throughout the early stages. Then he blew up one colonel on a bomb and I had a chance, which I from that point made the most of. I'm glad I won because I'd have felt silly if I'd have lost! You can see my blue colonel in the position of the flag after I struck it. Never expected that when I struck it! Amazing win for my new high!!! (545) !!! ​So my opponent, Guscaper, a platinum spy, came out swinging with marsh and gen on both side (left) and trapped a colonel of mine along the side, then took it. I counterattacked with my colonel on the right and took a leuit, then chased a major back into my territory, I moved my spy as a bluff to kill the major and he ran it into a bomb. Then his marshal comes by and moves next to the spy (thinking it's the marshal or general) and I take his marshal--- we're doing pretty good at this point!!! I force his to exchange gens, but his unknown col goes on a lotto spree and he calls my minor-marshal bluff taking 2 capts 1 minor and a sarge and leuit, sidestepping my bombs. Now I'm up a marsh, major, down col, and minor pieces. A bit worried now. I trap his other colonel with my marshal on my side of the board but by a brilliant play by my opponent he craftily gets a minor past my defenses, so it's decision time, trap the minor before he gets to my flag or keep trapping the colonel. Of course I trap the minor and his col lottos once more and takes a leuit and 2 minors (only 2 left At this point).. I finally trap his col upward against a bomb under the lake on my side, so now it's my major, capt, leuit, sarge, and 2 minors to his capt, 2 leuits, 2 sarges, and 2 minors. I'm dead. So my major is occupied with a minor on the other side of the board, my capt exchanges with his in the middle, and we exchange leuits on the right side. Not how I wanted it to turn out. So now it's my major, sarge, and 2 minors against his leuit, 2 sarges, and 2 minors. Almost no chance that I won't lose. But what's worse, my sarge makes a run for a possible open flag spot-- and he's captured by a leuit acting like a bomb So I have a major free (his 2 sarges trapped my minors, his minor making way down the other column, can't make it in time), and I charge his down the left side and hit the unmoved piece in the corner. AND..... KABOOOOM- Wait, it's not a bomb? No, it's his flag!!! the ever present danger of an open flag setup. well done. At least the flag wasn't in one of the 6 open squares... that may have been a bit too tough.. Cheers to the low gold player that I just had a really solid & close game with! He was up a 3/4/5 (American numbering) but I had some low-pieces left. Took me a while to figure out the right formation but got it in the end.